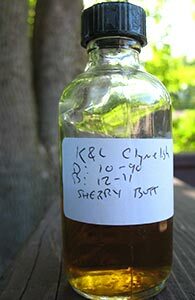 Another Chieftain’s exclusive for K&L, this time a sherried Clynelish. And you’ll be pleased to know that this time David D.’s notes included no problematic content, which saves me from having to go on about it, and saves you from skipping past that part of this post, I mean, reading it very carefully. I’m being ironic, but in truth, I much prefer when the whisky is the only thing drawing my attention. This was a bottle that I was interested in when it was first announced but as K&L don’t ship to Minnesota I thought I’d have to wait till I was in L.A next to get it and it was sold out by then. I only learned later that I could have purchased it online and had it held for pickup at the Hollywood store. Ah well, it’s not like I have a shortage of whisky on my shelves, and at least I get to taste some now. Nose: Succulently sherried: toffee and caramel to the fore, with raisins and milk chocolate right below. Some brine too after a bit, and a faint leathery note. With more time, a very faint hint of dried orange peel. Not very Clynelish at all, but very, very good. Actually, wait: with a lot more time there’s a clear briny note and a faint hint of smoke. With yet more time, there’s a meaty note too. A few drops of water bring out some ham and chestnuts; they also amplify the leatheriness. Palate: Wonderfully soft yet supple mouthfeel. Pretty much as on the nose but there’s more wood here. Not overbearing, but a nice reminder that this spent more than two decades in oak. Gets saltier as it goes. Water makes the palate more intense, dialing back the salt and amplifying some sweet wood spice; a touch of cinnamon too. Finish: The sherry separates just a tad at the very end and there’s a mild tannic astringence which is actually kind of bracing after the more seductive charms of the nose and palate. Comments: I’d guess this was not a PX cask (why Chieftain’s don’t put the type of sherry cask on any of their labels, I don’t know–you’d think they’d at least do it for their store bottlings). It’s not quite as decadent as the Mortlach I reviewed last night, but it’s very good indeed. More Clynelishy with water; without it’s a little more anonymous. With water I noticed once again the through line that I sometimes perceive between modern Springbank/Longrow and Clynelish (and often Highland Park and Talisker as well). Thanks to Tim R. again for the sample! This entry was posted in -Whisky by Rating, 85-89 points, Chieftain's, Clynelish, K&L, Store Bottlings, Whisky by Bottler. Bookmark the permalink. You’re just a dweeb – no real knowledge of scotch. This is an amazing dram. I’m guessing your tastebuds are off and you’re just an opinionated SOB. Always good to hear from the real fans.